We appreciate your interest in our online shop. You can visit our websites without giving any personal information. Each time a web page is called, the web server merely automatically stores a so-called server log file, which can be used, for example. includes the name of the requested file, your IP address, the date and time of the retrieval, the amount of data transmitted and the requesting provider (access data) and documents the retrieval. This access data is used solely to ensure trouble-free operation of the site and to improve our offerings evaluated. In accordance with Art. 6 para. 1 sentence 1 lit. F DSGVO the preservation of our legitimate interests, which predominate in the context of a weighing up of interests, in a correct presentation of our offer. All access data will be deleted no later than seven days after the end of your page visit. If you subscribe to our newsletter, we will use the data required or separately provided by you to regularly send you our e-mail newsletter based on your consent in accordance with Art. 6 para. 1 sentence 1 lit. You can unsubscribe from the newsletter at any time and can either by a message to the contact option described below or via a dedicated link in the newsletter done. After unsubscribing we delete your e-mail address, as far as you have not expressly consented to a further use of your data or we reserve the right to further data use, which is permitted by law and about which we inform you in this statement. 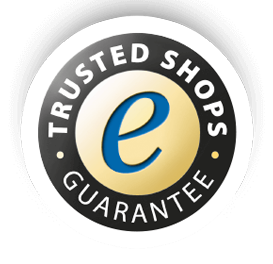 To display our Trusted Shops seal of approval and the collected reviews as well as the offer of Trusted Shops products for buyers after an order, the Trusted Shops Trustbadge is included on this website. This serves to safeguard our legitimate interests in the optimal marketing of our offer in accordance with Art. 6 para. 1 sentence 1 lit. f DSGVO. The Trustbadge and the services advertised are an offer of Trusted Shops GmbH, Subbelrather Str. 15C, 50823 Cologne. By accepting cookies, the functionality of our website may be restricted. You may revoke your consent at any time with future effect by downloading and installing the browser plug-in available at the following link: http://tools.google.com/dlpage/gaoptout?hl=en. This prevents the collection of data generated by the cookie and related to your use of the website (including your IP address) as well as the processing of this data by Google. Our website uses social plugins (“plugins”) from social networks. If you visit a page of our website that contains such a plugin, your browser connects directly to the servers of Facebook, Google, Twitter or Instagram. The content of the plugin is transmitted by the respective provider directly to your browser and integrated into the page. By integrating the plugins, the providers receive the information that your browser has accessed the corresponding page of our website, even if you do not have a profile or are currently not logged in. This information (including your IP address) is transmitted by your browser directly to a server of the respective provider (possibly in the USA) and stored there. If you are logged in to one of the services, the providers can directly allocate the visit to our website to your profile in the respective social network. If you interact with the plugins, for example by clicking the “Like” or the “Share” button, the corresponding information is also transmitted directly to a server of the provider and stored there. The information will also be posted on the social network and displayed there to your contacts. This serves to safeguard our legitimate interests, which predominate in the context of a weighing up of interests, in the optimal marketing of our offer pursuant to Art. 6 (1) sentence 1 lit. f DSGVO. https://help.instagram.com/155833707900388If you do not want the social networks to directly associate the data collected through our website with your profile in that particular service, you must log out of that service before visiting our website. You can completely prevent the plugins from being loaded even with add-ons for your browser. With the script blocker “NoScript” (http://noscript.net/). On this website content from third party providers are included. This content is provided by Google LLC (“Provider”). Youtube is operated by Google LLC, 1600 Amphitheater Parkway, Mountain View, CA 94043, USA (“Google”). For videos from Youtube that are included on our site, the advanced privacy setting is enabled. This means that no information is collected and stored on Youtube by website visitors, unless they are playing the video. The integration of the videos serves the preservation of our legitimate interests, which predominate in the context of a weighing up of interests, in an optimal marketing of our offer in accordance with Art. 6 (1) sentence 1 lit. f DSGVO. On this website content from third party providers are included. This content is provided by Vimeo LLC (“Provider”). The integration of the Videso serves the preservation of our legitimate interests, which predominate in the context of a weighing up of interests, for an optimum marketing of our offer in accordance with Art. 6 para. 1 sentence 1 lit. f DSGVO. For videos of Vimeo, which are integrated on our site, the tracking tool Google Analytics is automatically integrated. We have no influence on the settings of the tracking as well as the results of the analysis, and can not see them. In addition, Web beacons are set via the embedding of Vimeo videos on the website visitors. To prevent the setting of Google Analytics tracking cookies, you can prevent the storage of cookies by setting your browser software accordingly; however, please note that if you do this, you may not be able to use all the features of this website to the fullest extent possible.